Bethlehem Steel’s four win road streak is over. Pittsburgh Riverhounds trounced their much younger in-state opponents 4-1 Friday night. 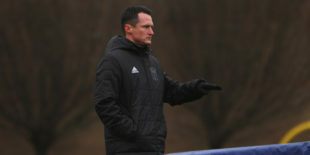 The team that Steel head coach Brendan Burke has called the best defensive side he’s seen proved to be just that, as the Riverhounds conceded only a penalty kick, handing Bethlehem Steel FC their second straight loss. After playing the more dominant game for the better part of 15 minutes, Pittsburgh began the scoring in the 17th minute. From a dangerous position, outside the corner of the penalty box, the Riverhounds were awarded a free kick after Bethlehem’s Michee Ngalina took one of their players down from behind. Pittsburgh’s Ben Zemanski effortlessly took the kick, curling it in toward’s the jumble of players in the box, where a hulking Joseph Greenspan was ready. Greenspan beat the noticeably shorter Brandon Aubrey in the air, heading the ball back towards the opposite post. Bethlehem keeper John McCarthy had no chance to stop it, as Pittsburgh took the lead. Bethlehem were given a generous chance to even things up in the 34th minute. Attempting to receive a headed pass from Brandon Aubrey into the box, Faris fell, evidently taken down by the very man who scored Pittsburgh’s opener, Joseph Greenspan. The call was questionable, but nonetheless Pittsburgh conceded their first penalty kick of the year. Bethlehem Steel captain James Chambers lined up for the kick and took it in the same way he leads the team: no nonsense, no stutter steps, just execution. Chambers slammed the ball to the back left corner of the net, evening the score. It was the midfielder’s third goal of the season and just the fourth goal conceded by Pittsburgh at home all season. The two teams almost walked into the locker rooms at halftime even, with Bethlehem probably feeling a bit lucky. Almost. In the 45th minute, after Pittsburgh managed to knock the ball around a bit outside of the penalty box, Pittsburgh’s Neco Brett laid it off to wingback Kenardo Forbes. Forbes decided to take a chance from far out, ripping the ball towards the far post and past an unprepared McCarthy. Pittsburgh would finish the half up 2-1. Matters would only worsen for the Steel in the second half. After grabbing an assist in the first half, Neco Brett added to Pittsburgh’s tally in the 76th minute. Fighting for the ball in the top corner of the box, Brett caught a lucky bounce to his left foot. With no Steel defenders in front of him, Brett hit it to the far post. Again, McCarthy could do nothing to stop it. 3-1 Riverhounds. Pittsburgh would finish the match off in the 79th minute. Gathering the ball at the midfield mark, former Philadelphia Union draft pick Ray Lee took it all the way to Bethlehem’s endline, where he chipped it over a reaching John McCarthy to a streaking Jordan Dover. Dover volleyed it in stride and buried it for Pittsburgh’s fourth goal. Union players get a rest. Despite the bye week and lack of MLS game constraints, Bethlehem’s roster held relatively few Union players. The only Union players who did make the start were not surprising. Olivier Mbaizo rarely makes the Union 18 and frequently starts for the Steel. Marcus Epps has been a frequent Steel starter of late. John McCarthy will get Bethlehem minutes whenever the Union do not have a coinciding match. No other Union players were rostered. In the past, Derrick Jones would have played this game in the past. Perhaps with Borek Dockal’s injury, Jim Curtin has chosen to give the young midfielder a rest with the prospect of starting upcoming matches. A night of youth. While U.S. prospects like Weston McKennie and Tyler Adams took the pitch against powerhouse Brazil on prime time, Bethlehem Steel also exercised their young talent. This is nothing new, of course. Much has been made of Bethlehem’s average age, which has been increasingly lower with each passing season. Still, this lineup in particular deserves some recognition. The Steel’s starting front four alone was especially youthful. Starters Faris, Brenden Aaronson, and Michee Ngalina are all 18 years old. Like the international match, the young players were no match for the established veterans, but as both Bethlehem and the USMNT were playing for development as much as victory, both coaches will no doubt take their respective losses with a grain of salt. Doubt creeps in. Bethlehem Steel’s playoff hopes were looking quite good recently. They currently sit at sixth place in the Eastern Conference table with a solid 42 points. Chris Sherman’s last SEBA projections had the Steel’s playoff chances at a resounding 92.4% However, after winning six out of seven games, the Steel have lost their last two – one at home, one away. This is by no means reason for panic, but Bethlehem have played more games than any other team in the conference. They’ll need to return to form fast if they want to see the post-season pitch. Substitutes not used: Tomas Romero, AJ Paterson, Ben Ofeimu. Michael Kirk; Joseph Greenspan, Tobi Adewole, Thomas Vancaeyezeele, Jordan Dover, Ray Lee; Kenardo Forbes, Ben Zemanski (Joseph Holland 82′), Mouhamed Dabo; Romeo Parkes (Noah Franke 75′), Neco Brett (Olakunle Banjo 82′). Substitutes not used: Nathan Ingham, Joe Holland, Hugh Roberts, Andrew Lubahn, Kay Banjo, Benjamin Fitzpatrick.